How many collars does your dog have? 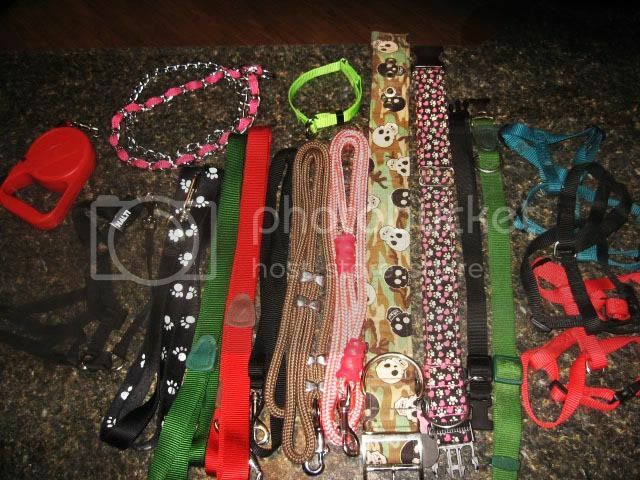 SugarFox03 wrote: This is all of our Collarmania collars. We have lots of regular boring collars, but they don't really wear those anymore. I love top pink and black one.. how would I order one so that it appears to have that stripe on it? 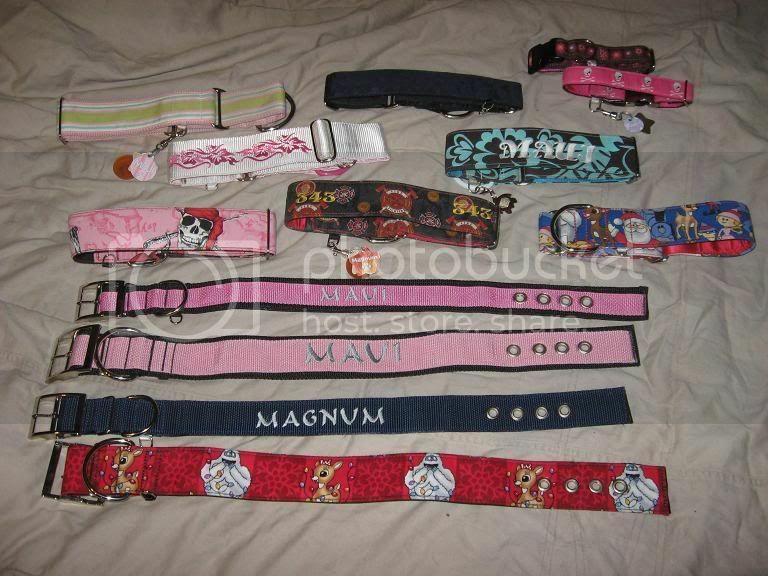 just order the embroidered nylon collar and under the additional notes indicate "use pink strip down the middle for embroidered name"
Sweet... thanks Lisa... What font is that that Maui and Magnum are written in? I thought I would bump this thread back up. good night! 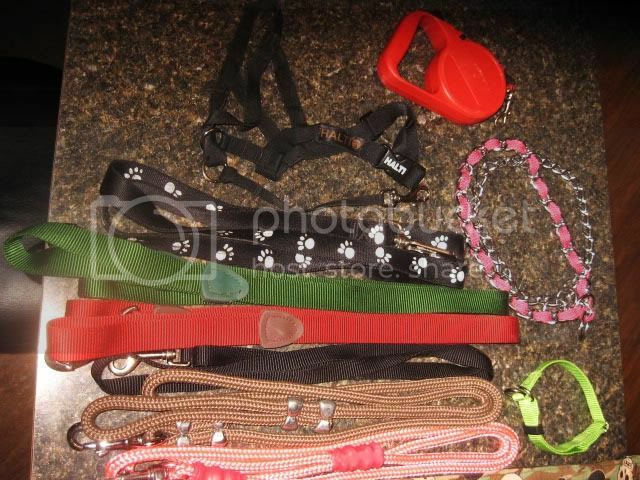 i hadnt seen this thread.......stimulate the economy buy a dog collar! what i would really like to see in this thread is a 'first collar' and a 'collar now'.....i often forget how small Wyatt was when i first got him. I remember Gypsy's first collar. It was a tiny little choke chain (I know, I know! Before I was dog smart ). It would fit on a chihuahua. Now it wont fit over her nose! OHH! Now I remember, that black collar was Tank's when we first got him. You can compare how big Tank has gotten by looking at the black collar and his collar now, the camo one with skulls. He has gotten BIG! 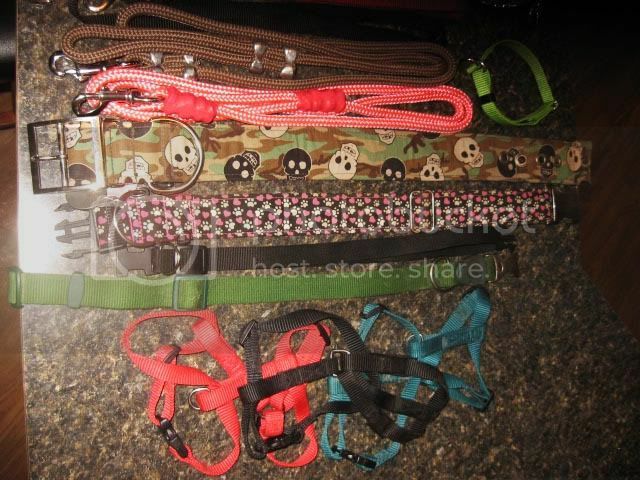 I have 7 right now for two dogs, they had a couple cheap nylon and plastic buckle ones but I gave them and all the other leashes/collars we don't use to a rescue. We kept all the collarmania, stillwater and ella's leads. 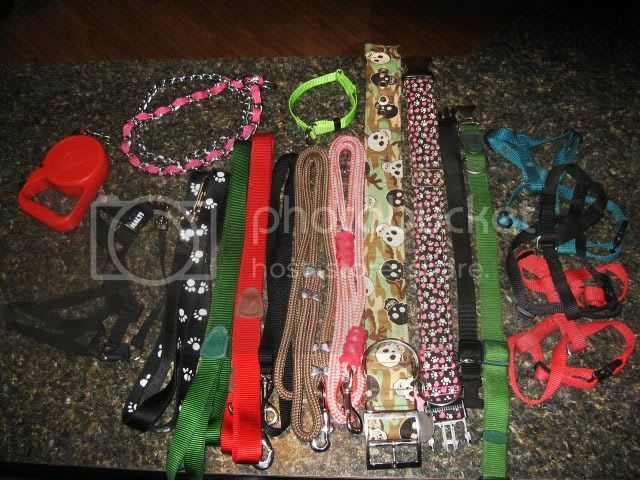 I could probably pay a monthsworth of my mortgage if I sold off all of my collars and leashes. I'm a bit of an addict. geez my dogs have about 2-3 each... we're so far behind!! Yeah, me too. I've been meaning to get Roscoe a new collar, but I still can't decide what to get. Sully is obsessed with collars(not me of course). He has around 30 or so. (I stopped counting at 20). 20 of them are in current rotation, the rest are sesonal depending on the time of year. and 4 fabrics I have chosen that Sully's daycare provider is in the process of making for me. Does that make around 40? I hope my husband doesnt see this. It is nice to know that I am not the only one. Bump...anyone have any new collar pics?